L’Oréal, known for the excellent caliber of its training and people, has acquired a global reputation as a “talent factory,” successfully pooling the skills of employees spread throughout the world. Even in the Miami headquarters, regarded as a Latin American mainstay, L’Oréal Travel Retail’s staff represents 24 different nationalities representing five continents and with Beauty Advisors that are spread over 16 countries. “L’Oréal TRAM (Travel Retail Americas) is super-international and very diverse. Not only do our talents come from different parts of the world, but they deal with the complexities of the travel retail market, which is very different than the local market. They must understand the buying habits of consumers / markets / economies of different countries of the world. Not only do they deal with North & South American consumers, for example, but also with the Japanese, Chinese and Russians, among others,” explains Munir Kamil, Director Human Resources – Travel Retail Americas at L’Oréal. TR is a much more complex business than that on the domestic market, says Kamil. “If you have marketing product managers in the local market, they are more focused on their specific local market. But the travel retail product manager sitting in Miami must also understand the Japanese consumer / market trends, while developing the Hawaii market; to ensure that consumer gets the desired products and service. This complexity is equally true for marketing, commercial and every other function of the company. This is the crux of L’Oréal’s strategy, says Kamil: to bring different types of talent into the Miami office from across the world, and then develop them as even more diverse and international professionals to take on even bigger challenging roles in the future. Really acting as a talent school for its people from every part of the world. Much of L’Oréal’s training now involves digital, and the company has embarked on a major program to increase awareness of the opportunities provided by digital and to improve the skills of its people in using digital. “The objective was to go beyond the basic social media such as Facebook, Twitter, Instagram etc, in order to develop real tools that could make a difference in our business today and in the coming years,” says Kamil. In November of last year, L’Oréal TRAM’s Marketing, Commercial and Retail Education teams met with the Managing Director for an informative session in which he communicated the importance of the digital strategy. In alliance with L’Oréal NY, TRAM implemented an online assessment to determine the level of digital knowledge gaps in the marketing teams to customize their training needs. At the same time, working with Paris, they launched the L’Oréal Group’s 16-module training tool, called Essentials of Digital Marketing, EDM, which was posted on the L’Oréal online platform between February and May. During this time, a series of in-depth workshops were also held, covering a range of digital-related topics. By April 15th, 85% of the targeted population had consumed the EMD must have modules; today that number is at 100%. 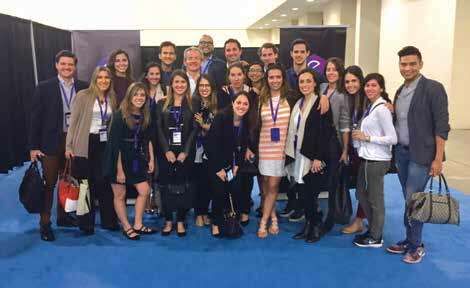 “To further nurture innovation, we took all of the members of the marketing, commercial and education teams who had completed the training to the 3-day Emerge Americas Conference in Miami in April, where our teams were able to meet with top digital experts from different industries,” says Kamil. “This was a huge investment in time and effort but was a great success in expanding the horizon of our teams and their digital understanding. The sessions help them build not only the understanding and role of digital in today’s world but also to network with the top digital solution providing companies. When we came back, I challenged all the teams to think about how digital could be used to transform the way we work, conduct business and build our portfolios. Each team was to identify a technology that will accelerate their business units and generate incremental profit, giving them one month to prepare. “The results were very interesting. At the end of May, using the insights they obtained from the conference, each division presented ideas that were relevant, out of the box and showcased creativity. We chose our winning ideas and some of these ideas will be implemented going forward.